Please do not link to this transcript from the cabin_pressure community, as they have their own transcribers and I in no way wish to invade their work. Thanks. DOUGLAS: OK, Martin, your turn. MARTIN: All right. I came through Customs and all I had to declare was some ... (he pauses momentarily) ... jelly from New Delhi, a tunic from Munich, some maracas from Caracas and some ... cattle from Seattle. DOUGLAS: Oh, that’s odd. We’re here, Carolyn and Arthur are in the cabin. Who else knows that number? DOUGLAS (switching on the sat comm): Hello, MJN Air. Is that God? HERC (over sat comm): Oh, I wouldn’t go that far. DOUGLAS (unhappily): Oh, hello, Hercules. HERC: Hello, Douglas. Call me Herc. DOUGLAS: Did you want anything in particular, HHHHerc? HERC: I did, actually, yes. Is, um, is Carolyn around? DOUGLAS: She’s around in the sense that she’s in the cabin doing her job, just as we are in the flight deck, rather busy doing ours. HERC (insincerely): Oh, I’m sorry. Did I interrupt at a crucial stage in a word game? MARTIN (stuttering): I-I-I-I’ll get her for you. HERC: No-no-no, it’s all right, no. If you could just pass on a message. Turns out Friday is better than Saturday for the opera, so I’ll pick her up at one. DOUGLAS: Yes, of course, sir. Anything else we can do for you? Wish your Aunty Edna a happy birthday? Tell your bookie to put a fiver each way on Gentleman Joe? Because we are of course essentially an airborne secretarial service. MARTIN (talking over him): Will do, Herc. It’s-it’s no trouble at all. DOUGLAS: There’s no point toadying to him. He’s not going to get you a job at CalAir. MARTIN: I’m not toadying. I like him. Why don’t you? DOUGLAS: I’ve known him longer than you, that’s why. DOUGLAS: And he’s a smooth-talking old smarm-pot who thinks he’s the best thing to happen to the sky since rainbows. MARTIN: No wonder you don’t like him, then. MARTIN: He’s nicking your act. DOUGLAS: OK, Carolyn, let’s try it without the camera first. Are you ready? CAROLYN: Hello. It is my very great pleasure to welcome you aboard. DOUGLAS: Thank you, Arthur. It’s usual, in fact, to shout that before the actor begins speaking. ARTHUR: Oh, sorry. I was confused by you saying ‘go’. And then I thought I’d better say it anyway, you know, to be on the safe side. DOUGLAS: Let’s try again. Arthur, ready to say ‘action’? DOUGLAS: Carolyn, ready to go? CAROLYN (tetchily): Get on with it. CAROLYN (in the stilted forced accent): Hello. It is my very great pleasure today to welcome you all aboard this MJN Air flight. DOUGLAS: May I stop you there? Try to remember you’re the owner of an airline welcoming your passengers, not a monarch addressing her subjects. CAROLYN: I fail to see the distinction. DOUGLAS: Even so, maybe you could try it just a touch less like Queen Victoria recording an answerphone greeting. I mean, you might even try risking a smile! DOUGLAS: Ah. Do you have anything less ... sharky? CAROLYN (continuing the script): ... so please pay attention to the safety demonstration even if you’re a frequent flyer, as aircraft may vary. DOUGLAS: This one especially – from flight to flight sometimes. ARTHUR: And then I do the safety demonstration. CAROLYN: As owner and manager of MJN Air, my first priority is to ensure you have a comfortable and enjoyable flight. MARTIN: Is it?! ’Cause that hasn’t really been coming across. What’s going on? ARTHUR: ... but on film, like in a film! CAROLYN: ... and I’m doing a welcome message. MARTIN: Arthur’s doing the safety demo?! CAROLYN: Yes, he is! Why shouldn’t he? DOUGLAS: Arthur does have a rather free-form approach to his art. ARTHUR: Ooh! We could do it like a disaster movie! MARTIN: Surely you should do that one, Carolyn. CAROLYN: No I should not. DOUGLAS: That was the original plan. In fact, we did a trial run this morning, but watching it back, Carolyn was worried she looked rather ridiculous. MARTIN (politely to Carolyn, though clearly unconvinced): Oh, I’m sure you didn’t. DOUGLAS: Oh, she did – utterly ridiculous. I didn’t say she wasn’t right to be worried. CAROLYN (more firmly): Thank you, Douglas. DOUGLAS: She looked like a musical grapefruit. CAROLYN (angrily): That will do! MARTIN: Carolyn, I really feel I ought to do the welcome message. I mean, after all, I am the captain. People want to hear from the captain. They find it reassuring. CAROLYN: Martin, when has anyone ever found you reassuring? CAROLYN: Look, I’m sorry, but this needs to be calm, relaxed and authoritative – none of which, I’m afraid, are qualities for which you are famous. DOUGLAS: Mind you, they’re terribly hard qualities to find. MARTIN (anything but calmly): I am calm! I’m very, very calm – and authoritative, and-and, er, the other one. What was the other one? I can do that as well, whatever it was. MARTIN (frantically): Yes! I’m very relaxed! CAROLYN: All right. Give it your best shot. CAROLYN: Thank you, Martin. We’ll let you know. MARTIN: No-no-no, wait-wait-wait! OK. (He clears his throat.) I’m ready now. MARTIN (calmly): Hello. Welcome to MJN Air. (His calmness immediately begins to disintegrate.) M-m-my name is Captain Martin Crieff, though that doesn’t matter – it’s all very informal here. Just call me Martin ... well, in the context of this video, anyway. If you actually see me in person, it’s probably best you do call me Captain Crieff, or just Captain. It’s just protocol, I’m afraid, um, but if it was up to me you could call me ... ‘Marty’. (Slight pause.) No, no, actually, no, no, let’s not confuse things: definitely don’t ever call me ‘Marty’. Right, so, to recap: hello. I am Captain Martin Captain ... Captain Crieff, Crieff, I mean! Can we start again? DOUGLAS: You old perfectionist, you. ARTHUR: I thought he was great! CAROLYN: You think everything’s great. DOUGLAS: To be fair, Carolyn, he was no worse than you. CAROLYN: I know! All right. I was hoping to avoid this, but let us bow to the inevitable. (She draws in an unhappy breath.) Douglas, you can do it. MARTIN (despairingly): Oh, Carolyn, no! CAROLYN: I don’t like it either, Martin, but since we have a pilot who sounds like Stephen Fry’s favourite uncle, we might as well use him. Go on, then, Douglas – do your stuff. DOUGLAS: Um ... no, thank you. DOUGLAS (awkwardly): I’d ... rather not. CAROLYN: You’d rather not? But surely this combines your twin passions: scoring off Martin and the sound of your own voice. DOUGLAS: Oh, how little you know me. You see, my secret sorrow, Carolyn, is that I suffer from a quite crippling lack of self-confidence. DOUGLAS: Absolutely. It is my curse. MARTIN: Well, that’s settled, then. I’ll do it. CAROLYN: No you won’t. So: I can’t do it, Martin shouldn’t do it, and Douglas won’t do it. Great. ARTHUR: Shall I do it? CAROLYN, DOUGLAS and MARTIN (simultaneously): No! ARTHUR: Hang on, Douglas, I’ve dropped it again. DOUGLAS (as they both stop): You see now why I’m carrying the video camera and you’re carrying the lifejacket. ARTHUR: Yeah, fair enough. Douglas? Are you really not going to do the welcome speech? DOUGLAS: It would seem not. ARTHUR: Because I think you’re being hard on yourself. I think you might be quite good at it if you tried. DOUGLAS: Don’t be ridiculous, Arthur. DOUGLAS (talking over him): Of course I should do it. I would be superb. DOUGLAS: Welcome to MJN Air, putting the excitement back into air travel – sometimes too much so. ARTHUR: Oh, yeah! You are! You sound just like one of those guys who does that! Brilliant! Let’s go and tell Mum. DOUGLAS: Not so fast, man-cub. If Martin knows I want to do it, he’ll put up a fight – a fight I would win, naturally, but why bother? Whereas if I have to be persuaded to do it, I can get a quid pro quo. ARTHUR: What’s quick pwo kwo? DOUGLAS: D’you know, I haven’t even decided yet. Right, into the plane, Garbo, it’s time for your close-up. MARTIN (trying to sound smooth): Hello, I’m Captain Martin Crieff. Hello. My name is Captain Martin Crieff. MARTIN (his voice gradually becoming more frantic): This is Captain Martin Crieff. My name’s Captain Martin Crieff. DOUGLAS: Hello. I’m looking for a Captain Martin Crieff. Have you seen him? MARTIN: Why can’t I make it sound authoritative? ARTHUR: Hi, Skip! We’ve come to film my bit – on location. MARTIN: This is Captain Martin Crieff spea ... I think it’s my name. ARTHUR: That means in the actual place where the thing is meant to be. DOUGLAS: You’re recording a demo for Carolyn, are you? ARTHUR: So, in this case, because the scene is set in a plane, we’re doing it in the plane. MARTIN: Yeah. Martin. Martin. It’s just not a captain’s name. Martin. ARTHUR: Rather than building a set ... (tetchily) which we can’t afford, apparently. DOUGLAS: What’s a captain’s name? MARTIN: This is Captain Douglas Richardson. MARTIN: You see, it sounds much better. DOUGLAS: It does sound rather good. MARTIN: Captain der-der-DER-der-der. That’s what you need – not Captain der-der-DER...ff. CAROLYN: All right, studio, are we ready? Camera in position, lighting rigged? DOUGLAS: In as much as I’m pointing the camera at him and I’ve turned the lights on, yes. CAROLYN: Ready, Arthur? ... Oh, I see the hat’s back. ARTHUR (serenely): The hat is paramount. DOUGLAS: It’s certainly biggest. All right, Arthur, in your own time. DOUGLAS: You can say ‘Action’. ARTHUR: Good evening, ladies and gentlemen – or good morning if it’s the morning when you watch this, or hello if it’s ...well, any time. Hello. Er, my name is Arthur and it’s my pleasure to be being your cabin crew today unless it’s Mum. If Mum’s being your cabin crew today, then it’s her pleasure to be being it and it’s my displeasure not to be. But at least I’m here on the video, so it’s a little bit me as well and I’m pleased about that. DOUGLAS: Very good, Arthur. An excellent start. Shall we, though, stick to the version in the script for now? ARTHUR: Oh, yes, OK. Er, what was that again? ARTHUR: Right, yes. Hang on, just let me practice. Hallo. Hallo. No, hall... hallo. (Cheerfully) Hallo! DOUGLAS: Carolyn, you’re absolutely sure you don’t want to do this yourself? DOUGLAS: Fair enough. I’m sure that’s a wise decision. CAROLYN: Well, you’re the one who said I looked stupid in that lifejacket. ARTHUR (loudly, in a ridiculous voice): Hellooo! CAROLYN: The alternative will be fine when he’s had a bit of practice. DOUGLAS: If you say so. OK, Arthur, let’s try the next bit. DOUGLAS: Action, and also go. ARTHUR: Right. Your seatbelt is fastened, adjusted and unfastened like this. (Rattling noises.) Hang on. Oh, no. Sorry, it’s different when you’re not wearing it. Um, anyway, what-what-what should happen is you put the metal square bit into the metal box of matches bit until it goes ‘click’ ... No, no, it’s more of a ... (he tries to impersonate the click) ... No, no, it’s ... (he clicks his tongue twice) ... No, that’s a dolphin. If it makes a noise like a dolphin, I don’t know what you’ve done. Now, your nearest exit – which may be behind you – is being pointed out by a member of the cabin crew ... probably me ... er, the other me, the real me. Look at the real me. Now look back at the me me – I mean, this me, me ... the me that’s talking. If the other me’s talking as well, then shut up, me! This is my bit! CAROLYN: Fine! Fine! I will do it! DOUGLAS: Maybe you’re right. So you’ll do the safety demo and the welcome, then. Will you do one in disguise, or is the idea that you’re identical twins? CAROLYN: No. Obviously you’ll have to do the welcome. DOUGLAS: Well, as I say, the debilitating shyness ... Anyway, changing the subject abruptly and completely, where are we flying next? DOUGLAS: Oh! Rotterdam. Lovely place. Awfully near Spa. DOUGLAS: Spa. Lovely town in Belgium, about two hundred miles away. Gave its name to the, er, well, the spa, logically enough, and this weekend, I believe, the site of the Belgian Grand Prix. In fact, Carolyn, a thought has just occurred to me: would you mind if I nipped over to see it while we’re there? CAROLYN: Well, you can if you like, but I don’t see how you’re going to ‘nip’ two hundred miles and back. DOUGLAS: No. I suppose, to do that, I’d require some kind of, er ... I don’t know, flying machine. CAROLYN: What? No! Absolutely not! You’re not borrowing Gerti to fly yourself to the Grand Prix! DOUGLAS: That’s a shame, because it did occur to me that the excitement of the Grand Prix might be just the thing to put some fire in my belly and help me overcome my terrible fear of cameras. CAROLYN: Oh, I see. Not content with exacting a quid pro quo for things you don’t want to do, you’re now demanding them for things you do! DOUGLAS: I don’t know what you mean. CAROLYN: Well, I’m damned if I’m bribing you to do something you want to do anyway. MARTIN (cheerfully): Good morning, Carolyn. CAROLYN: Martin! You’re early. We’re not going to Rotterdam ’til two. MARTIN: I know, but I know you want to do that film today and I thought you might want to listen to this first. MARTIN: I spent the whole of yesterday recording it on my phone and I think you’ll agree it’s pretty much exactly what you asked for: calm, authoritative, relaxed. Listen. MARTIN’s VOICE: Hi, guys. My name’s Martin Crieff, the captain, and I’m the guy in charge of flying you today. On behalf of the rest of the guys on my team and the guys back on the ground, let me give you guys one hell of a big MJN welcome on board today. Now, before we go right ahead and fly some plane, I’m going to ask you to pay attention to this short safety demonstration. Hey, I know, guys – big yawn, eh? (He chuckles.) But you know what? It might just save your life. (His confidence shatters and he starts to stutter nervously.) A-a-although, of course, an air accident is statistically incredibly unlikely. (He tries to get his confident tone back again.) OK. (He clears his throat.) See you on the flip side ... of the safety demonstration. Ciao! CAROLYN: Goodness. That’s you being relaxed, is it? MARTIN: Well, relaxed but authoritative, like, like, like a cool teacher. CAROLYN: I see. Well, sadly, Professor Fonz, the vacancy has been filled. (She calls out.) Martin! Could you come here a moment? CAROLYN: How, then, would you evaluate the chances that I am referring to you? SECOND MARTIN: Hello. I’m Martin. I’m the captain. Good to meet you. MARTIN: No! I-I’m ... what d’you mean, you’re the captain? SECOND MARTIN: Yeah! You must be the first officer. Nice to meet you. MARTIN: No, I’m the captain. SECOND MARTIN: Ah. I thought I was the captain. CAROLYN: Indeed you are. Martin, Martin here is the real captain. Martin, Martin here is an actor. He will be playing the captain. MARTIN: B-but he-he-he’s dressed as a pilot! CAROLYN: I know! They stop at nothing, these actors. MARTIN: But the uniform ...! Where did you get your uniform? SECOND MARTIN: Mrs Knapp-Shappey supplied it. CAROLYN: From a fancy dress shop, actually. MARTIN: But it’s nicer than mine! CAROLYN: I know! I’ll be going back there in future. DOUGLAS: Morning, all. Oh, hello. SECOND MARTIN: Hello. I’m Martin. DOUGLAS: Goodness! What happened? Did you find a magic lamp? MARTIN: I’m over here, Douglas. CAROLYN: Martin is an actor, Douglas, whom I have hired to do the welcome. CAROLYN: So isn’t that sorted out rather cleverly by me, with no need for anyone to get a free trip to Belgium? DOUGLAS: You know, actually, Carolyn, perhaps I could be persuaded. CAROLYN: Right – the plan is: we’ll rehearse your speech, Martin, in the flight deck on the ground; then we’ll take you with us to Rotterdam so we can film it actually in the air. Douglas, come and help me set up. Martin, put the kettle on. No, not you, Martin; little Martin. MARTIN: I am not ‘little Martin’! SECOND MARTIN: So, sorry, you’re really a pilot? MARTIN: Yes! Yes, I really am. A captain. SECOND MARTIN: Right. Jolly good. MARTIN: And you’re really not. SECOND MARTIN: Good heavens, no! MARTIN: Because you really look like one. SECOND MARTIN: Do I? Is that a compliment? MARTIN (despairingly): I would give a year of my life to look like you. SECOND MARTIN (hesitantly): Oh ... right. Well, thank you. SECOND MARTIN: ... Martin. Hello. MARTIN: You see, when you say it, somehow it works. (Tentatively, as if dreading the answer) What’s your surname? MARTIN (fed up): Martin Davenport. “Good evening, this is Captain Martin Davenport.” Oh, you’ve even got a der-der-DER-der-der name! SECOND MARTIN: Sorry, what have I got? MARTIN (frustrated): So you look more like a captain than me, you sound more like a captain than me, you’ve got a better uniform than me and a better name than me. You must be very pleased. SECOND MARTIN: I really just came here to do a job. MARTIN: Look, just ... as an experiment. If you were doing the Falaya [see footnote] approach into Nice with a twenty knot wind from the north-east, which runway would you use? SECOND MARTIN: I’ve really no idea! SECOND MARTIN: Um, runway ... B? MARTIN: Runway B?! What’s that?! That’s not a runway! MARTIN: It’s either the Zero Four Left or the Zero Four Right! SECOND MARTIN (guessing): The Zero Four Right? MARTIN: No! Left! How could you not know that?! SECOND MARTIN: Because I’m not a pilot! MARTIN: Such a waste! Such a terrible waste! ARTHUR: Hi, chaps! Er, Mum says are you ready for the rehearsal? ARTHUR (calling towards the cabin): Yeah, they’re ready! MARTIN: How tall do you think he is? DOUGLAS: Oh, Martin, I have no idea! Six one, six two? MARTIN: Yeah, perfect height – taller than most people but not weird tall. DOUGLAS: You’ve really got to let this go, you know. CAROLYN: All right, drivers. Are you ready to make movie magic ... or at least sit and watch whilst movie magic is made beside you? Come on in, Martin. MARTIN (loudly, accusingly): How tall are you, Martin? SECOND MARTIN (groaning quietly): Er, six two. MARTIN: Huh! Told you so! Are you married? MARTIN: ’Course you are. Kids, too, I expect. MARTIN: Boy and a girl? SECOND MARTIN: How did you know? MARTIN (angrily): Just a hunch. CAROLYN: All right! If we could save the rest of the Creepy Stalker Quiz for later, let’s get going. Little Martin, if you could clear the captain’s seat for Big Martin. MARTIN (furiously): Seriously, Carolyn, I am not Little Martin. CAROLYN: So you keep saying, but the tape measure tells a different tale. DOUGLAS: You can take my seat, Martin. CAROLYN: What? No! No, you stay where you are, Douglas. DOUGLAS: No, I don’t think so. I am – as I believe I’ve mentioned before – terribly shy. CAROLYN: Oh, don’t be so childish. DOUGLAS (petulantly): I’m not being childish, but if I can’t go to the Grand Prix, I’m not being in the film! CAROLYN: ... it’s your lucky day – your big break into the moving pictures. You sit in Douglas’ seat ... and face away from the camera. MARTIN: This is the first officer’s seat. I’m not a first officer. CAROLYN (sternly): Martin, will you sit down now! MARTIN (almost in tears): Please, Carolyn! ARTHUR: We could call him Paramount Martin. CAROLYN: Fine. Paramount Martin. Now, we’ll start with a couple of seconds of the two of you flying; then you turn in your seat and you say the lines. SECOND MARTIN: OK. How do I look like I’m flying? CAROLYN: You put your feet up, play some stupid word game and gorge yourself on cheese. CAROLYN: No, no, forgive me. I was being satirical. Just grab the control column and look pleased with yourself. MARTIN: Of course, um, just a suggestion, but it might help if one of us was to say something to ATC? Just request a weather report or something, to give it atmosphere. CAROLYN: Yes, all right. Paramount Martin, do that. SECOND MARTIN: All right. What should I say? MARTIN (sarcastically, triumphantly): Oh dear, don’t you know what to say? CAROLYN: Martin, give him something to say. MARTIN: Or I could just say it myself. CAROLYN: OK, fine, but keep it short. And, go. MARTIN: Shanwick, Golf Tango India, requesting the weather at Reykjavik. CAROLYN (whispering): And Paramount Martin, go! SECOND MARTIN (painfully stiltedly): Hello. A-and welcome. On the behalves of all of us. Here at M and M Air – sorry! – MJN. Air! We know you have a wide choice. Of airlines and we ... er ... oh, oh, sorry, it’s gone. Line? DOUGLAS: Well, this is interesting. SECOND MARTIN: Is everything all right, do you think? MARTIN: Er, yeah, I’m sure it is. SECOND MARTIN: Why do you think she rushed out like that? And why did she take the other chap with her? MARTIN (hurriedly): Don’t know. No idea. No idea at all. MARTIN: So, Martin, um, tell me: do you ... do you ... do you get a lot of work? Are you a busy actor? SECOND MARTIN: Well, there’s not a lot of work, no. It’s all rather quiet at the moment, I think, for everyone. MARTIN: Right, right, right. But you make a living. SECOND MARTIN: Well, not entirely from acting, if I’m honest. I do a bit of taxi driving too, on the side ... and to some extent in the centre. MARTIN: I see. And have you always wanted to be an actor? SECOND MARTIN: Oh, always, always. Since I was five years old. Absolutely the only thing I’ve ever wanted to be – and it’s so frustrating when you know, without any doubt at all, what you were put on this Earth to do, and you just can’t seem to persuade anyone else. MARTIN (quietly): I can imagine. So, um, how did Carolyn find you? SECOND MARTIN: I’m on this website. I don’t normally get anything through it, but this was amazing! She didn’t even ask me to audition. MARTIN: Didn’t she? Fancy that. And-and – if you don’t mind me asking – how much is she paying you? SECOND MARTIN: Well, actually, I agreed to waive my fee. Er, you know, it’s a good cause, isn’t it? MARTIN: What? MJN? No – we’re not a good cause. We’re a terrible cause. SECOND MARTIN (despairingly): I just wanted to do some acting! No-one ever lets me do any acting! MARTIN: Listen, um, do you live in Fitton, Martin? MARTIN: D’you wanna ... go for a drink some time? MARTIN (frantically): Oh, no, no! Nor am I, no! I mean, d’you wanna go, you know, for a ... for a ... for a pint, er, yeah? A pint of, um, bitter ... or, er, or-or stout. SECOND MARTIN: Oh, yes! Yes, of course! I’d like that, Martin. MARTIN: So would I ... Martin. CAROLYN: All right, let’s get it over with. (She draws in a long breath.) I need you to do the welcome. DOUGLAS: I’ll do it if I can go to the Grand Prix. CAROLYN: You can’t go to the Grand Prix. DOUGLAS: Then you have your choice of the Martins. CAROLYN: Herc! What are you doing here? HERC: I’ve come to take you to the opera. HERC: No. Didn’t you get my message? DOUGLAS: Oh dear. Forgetful old Martin. HERC: Hello, and welcome to MJN Air. CAROLYN: Herc, are you doing anything tonight? HERC: Yes, I’m taking you to the opera. CAROLYN: Yeah, well, I’m afraid you’re not doing that because I’m going to Rotterdam, so I wonder: would you mind coming with me, popping on a fancy dress uniform and recording MJN’s welcome message? HERC: Oh. Oh, why not? Sounds rather fun. CAROLYN: Douglas unfortunately can’t do it because of his crippling shyness. HERC (insincerely): Oh, how sad. If only we could give the poor man the gift of self-confidence. DOUGLAS: You’ve ... you’ve made your point, Carolyn. I’ll do it. I’m happy to do it. (Grimly) Please. CAROLYN: Well, thank you, Douglas, but actually I think I prefer Herc’s voice. DOUGLAS: We hope you have a pleasant flight. HERC (smoothly): We do hope you relax and enjoy your flight. DOUGLAS (cranking up the smoothness): Please, do relax and have an absolutely splendid flight. HERC (going into full-on knicker-melting mode): You simply must have the most awfully lovely super-scrumptious flight. CAROLYN: All right, stop, both of you, before I drown in syrup! Douglas, if I were to be gracious enough to allow you the favour of providing the MJN welcome message, what is my quid pro quo? DOUGLAS (tetchily): Fine. I won’t go to the Grand Prix. CAROLYN: Ah, but you forget: you were never going to the Grand Prix, so what are you going to do for me? CAROLYN: All right. Everybody ready? I hereby present MJN Air’s first – and, please God, last – major motion picture. Arthur, press ‘Play’. DOUGLAS (on the recording): Hello. I’m First Officer Richardson. Thank you for choosing MJN Air. We wish you a peaceful and comfortable flight. Your security is very important to us, so please watch the following safety demonstration carefully, even if you are a frequent flier. DOUGLAS (on the recording): Hallo. I’m your steward, Dougie. DOUGLAS (on the recording): I’m the first officer’s identical twin brother. MJN Air – proud to be a family business. Before we take off, please give me your full attention as I demonstrate the safety procedures aboard this aircraft. MARTIN (full of giggles): You definitely have our full attention, I promise you that! ARTHUR: You look great in my uniform, Douglas! Even the hat! MARTIN (giggling): Especially the hat! CAROLYN (shushing them): We’re missing it! DOUGLAS (on the recording): When instructed, place your lifejacket over your head, pass the tapes around your waist and tie securely in a double bow at your side. CAROLYN (giggling): What’s that fruit I’m thinking of – like a grapefruit, but even bigger and more yellow?! MARTIN (almost incoherent through his laughter): A melon! DOUGLAS (on the recording): ... until you are outside the aircraft. To inflate, pull the red toggle sharply. CAROLYN: Beautifully done, don’t you agree, Herc? HERC: Oh, absolutely. Couldn’t have done it better myself – and under no circumstances would have tried. DOUGLAS (irritably): Yes, can we turn it off now? CAROLYN: No, certainly not. This is the best bit. DOUGLAS (on the recording): There is also a light, and a whistle for attracting attention. CAROLYN (deliberately stilted): But, Dougie, I don’t understand. How does the whistle work? Transcriber’s footnote: In an attempt to work out what Martin was saying at that point, I have probably – via Google – looked at more information about flying into Nice than Martin Crieff has! Oh, thank you! You're astonishingly quick! That's really sweet of you to find these for me! Sadly I still can't see the appropriate word, but I have tweeted John Finnemore in the hope that he might provide the word - or he might put something in his blog later in the week. 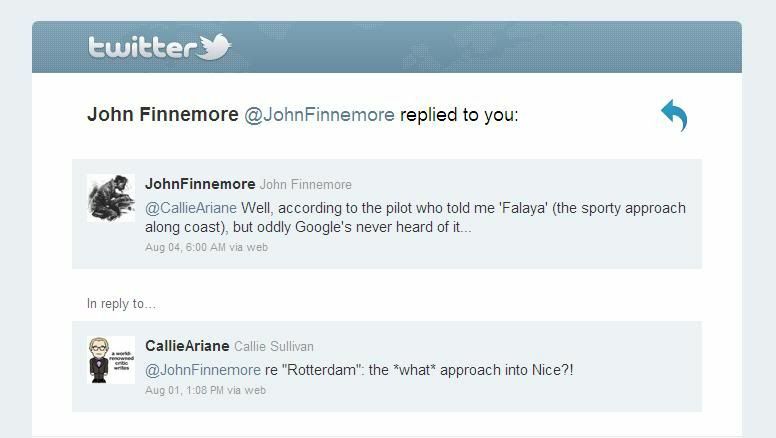 Oh, yes, I thought of asking John Finnemore, too. That's great, I hope he'll help. Oh, he's wonderful! I never doubted!